34 Landscape Architect and Specifier News Off the living room, one can find another separate seating area for intimate gatherings. A firepit is located at the optimal viewpoint for the site. All of these small seating vignettes offer different moods and attractions for the clients' guests and family. Visitors simply have to look around to find the perfect spot for whatever mood strikes or activity commences. 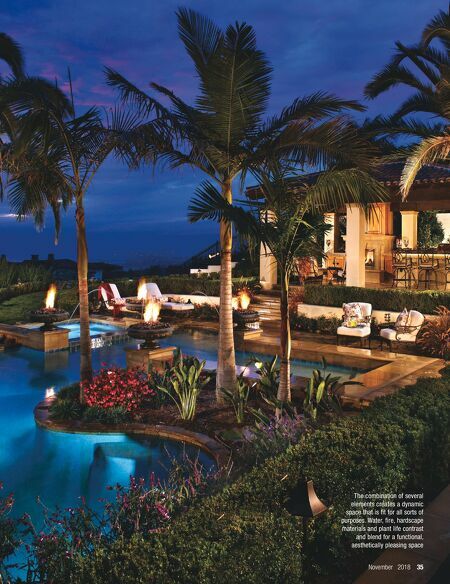 The lowered pool terrace was designed to emulate a tropical lagoon. To get the full effect, appropriately lush plant material was selected to border the curvilinear edges of the pool. It is accentuated with a natural boulder waterfall that adds a sense of movement to the area. The upper pool terrace features fire bowls that were imported from Spain and findijets that allow for an elegant water show to complement the view further. Though dueling elements such as fire and water might compete and make a landscape seem, in theory, messy and complicated, the dramatic effect of the features at night, coupled with colorful sunsets, makes for a beautiful sight. A custom chaise cabana perches over the grassy terrace at the edge of the property. It takes advantage of the southernmost views from the property, so visitors can relax comfortably while taking in the magnificent sights surrounding the home. A very high-quality synthetic turf was used throughout the yard. 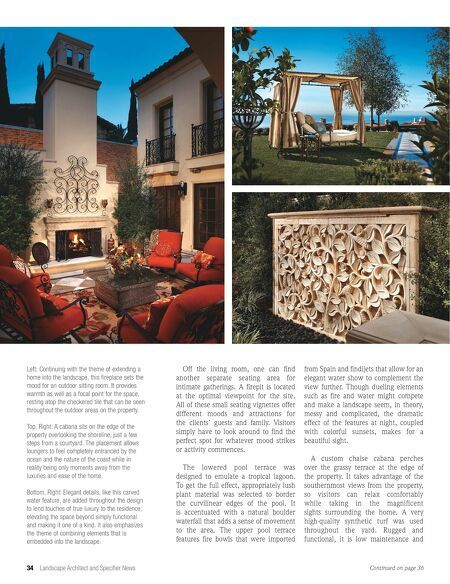 Rugged and functional, it is low maintenance and Continued on page 36 Left: Continuing with the theme of extending a home into the landscape, this fireplace sets the mood for an outdoor sitting room. It provides warmth as well as a focal point for the space, resting atop the checkered tile that can be seen throughout the outdoor areas on the property. Top, Right: A cabana sits on the edge of the property overlooking the shoreline, just a few steps from a courtyard. The placement allows loungers to feel completely entranced by the ocean and the nature of the coast while in reality being only moments away from the luxuries and ease of the home. Bottom, Right: Elegant details, like this carved water feature, are added throughout the design to lend touches of true luxury to the residence, elevating the space beyond simply functional and making it one of a kind. It also emphasizes the theme of combining elements that is embedded into the landscape.